In a bowl, whisk together the flour, baking powder, salt, paprika, and Old Bay seasoning. Whisk in the beer until the batter is completely smooth and free of any lumps. Refrigerate for 15 minutes. Refrigerating the batter allows it time to thicken, and a thickened batter adheres to the fish much better. A bit of time makes a better batter. You can make the batter up to an hour ahead of time. Now, when you’re ready to cut fish, cut the fish into one in strips, lightly dredge fish strips in cornstarch. Working in small batches, dip the fish into the batter and immerse in the hot oil. When the batter is set, turn the pieces of fish over and cook until golden brown, about 2 minutes. Drain the fish on a wire rack set over a baking sheet. Keep the fried fish in the warmed oven (about 200 degrees) while you cook the remaining batches. Serve with malt vinegar and chips. Canned crab meat is a great shortcut in making so many recipes where the crab is being used as an accompaniment. I usually don’t use the canned if I’m using crabmeat as a standalone, like stuffed crab salad. 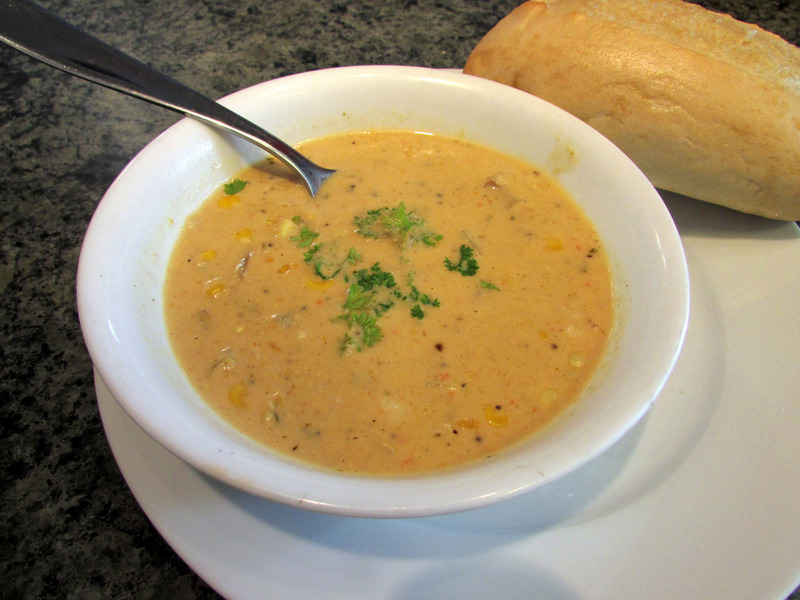 Although when I’m making a crab – corn chowder, I can go either way. But with this recipe, canned crabmeat for the stuffing is a great way to use canned crabmeat when you run across a good sale on it. Lightly grease a large casserole dish or a baking sheet lined with tin foil. Heat olive oil over medium-low heat in a large saucepan. Stir in onion, green onions, bell pepper, celery and garlic. Cook slowly, stirring occasionally until onions are soft. Then remove pan from heat and stir in shredded crabmeat, seasoning, bread crumbs, salt and pepper. Now, rub the flounder skin and cavity with butter. Stuff the cavity with crab mixture and place in prepared pan. 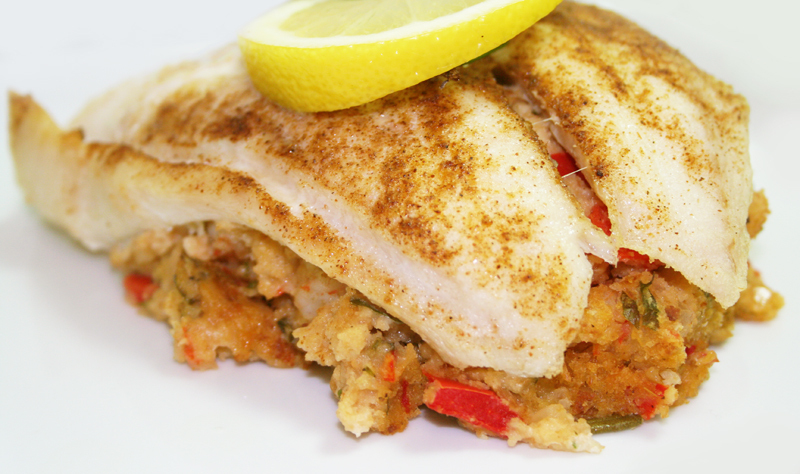 Bake this for 30 minutes, or until flesh is firm and white at the thickest part of the fish. The more adventurous cook will take the flounder head, put it in a pot of water with some celery trimming, left over onion ends, top and bottom of the green pepper that would otherwise been thrown out and other aromatics lying around, perhaps one of those soy sauce packets from the Chinese take-out, and make a fish stock. Then you use the fish stock to make couscous to serve with the flounder. Although chowder goes well with hush puppies, fish goes well with them also. Here’s a way of getting your hush puppies ingredients to pull double duty, while at the same time incorporating some sustainable fish fillets. Let’s make some baked whiting fillets to go with those puppies. Combine the cornmeal, cheese, seasoning in a bowl. Soak the fillets in the milk then dip in the egg wash and dredge through the cornmeal mixture. Lay the fillets in a shallow baking pan and bake for 15 to 20 minutes at 400 degrees. As we have talked about, biscuits go well with chowder. Now, from our early New England history, hush puppies make a nice side to chowder, and other seafood offerings. 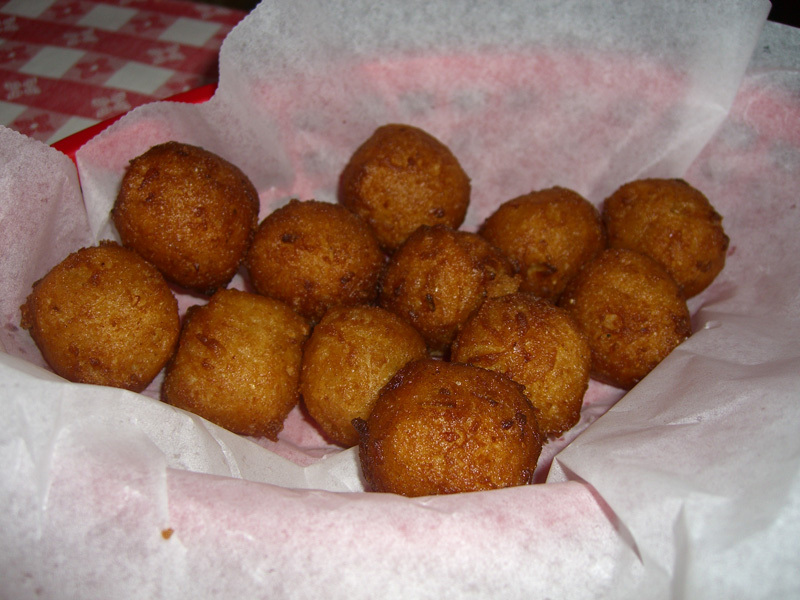 There are many different ways to make hush puppies from the simple to the complex. 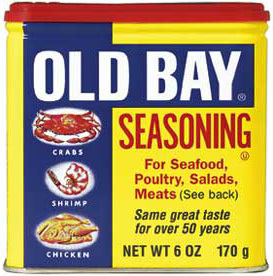 I like to keep things simple most of the time but I like to add seasoning, in this case old bay seasoning to the dry mix to flavor them up. They are a quick and simple fried corn batter ball originally attributed to the Indians of the Carolinas these were quickly adopted by the colonists of America and early New England fishing communities. They are a staple of southern cooking and popular in ‘fried foods’ restaurants today. Using a mixing bowl, stir together the cornmeal, flour, baking soda, salt, and seasoning. Stir in the onion. In a small bowl, stir together the buttermilk and egg. Pour the buttermilk mixture into the dry ingredients and mix until blended. Drop the batter, 1 teaspoon at a time, into the oil. Dip the spoon in a glass of water after each hush puppy is dropped in the oil. Fry until golden brown, turning the hush puppies during the cooking process. Transfer the finished pup to a paper towel for draining. Thin fillets of flounder are a good fish for deep frying. There small size cooks very quickly. 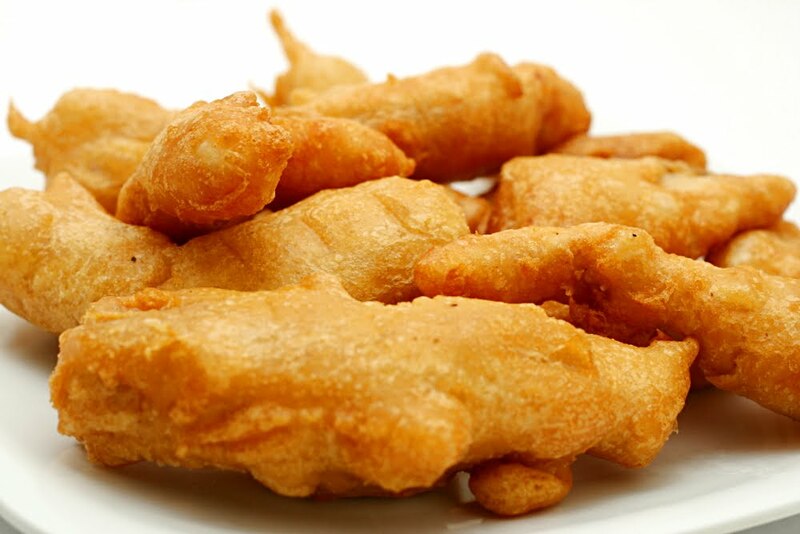 Using a heavy beer-batter to encase the fish actually reduces the amount of oil in the fish itself. The oil quickly cooks the batter and transfers that heat to cook the fish inside the batter. But even though… use good quality, non-transfat, high smoke-point oils like canola or peanut oil. You want to taste the fish, not the oil. Heat oven to 200 degrees. Pour the oil into a large Dutch oven, 1 inch deep. Heat the oil over medium-high heat until it reaches 375 degrees. Whisk the flour, salt, Old Bay, black pepper and cayenne together in a large bowl. When the oil is almost ready, whisk the beer into the flour mixture until completely smooth. Pat the fish dry. Add half the fish to the batter and stir gently to coat. Using tongs, lift the pieces of fish from the batter, allowing excess to drip back into the bowl; add to the hot oil. Fry, stirring pieces gently to prevent sticking together, until golden brown, about 5 minutes. Remove the fried fish to a paper towel to drain and keep warm in oven. Repeat process with the remaining strips of fish. Serve with lemon wedges and tartar sauce. I’ve been asked several times now for a ‘good’ recipe for tartar sauce. The sauce itself derived from the French sauce tartare, named after the Tatars from the Eurasian Steppe, who once occupied parts of Ukraine and Russia. The French probably stumbled upon this during the Napoleonic occupation. A recipe from Boston in the late 1800’s called for whole eggs, white wine vinegar, lemon juice, worcestershire sauce and butter. Today, most home-cook recipes skip the while egg and vinegar step and start right off with mayonnaise. So, I start with mayo too. Before I use the minced red onion, I rinse it with water and a touch of white vinegar to reduce its bite. Then, combine all the ingredients in a bowl. Once its all well mixed together I put it in a sealing jar and put it in the fridge. 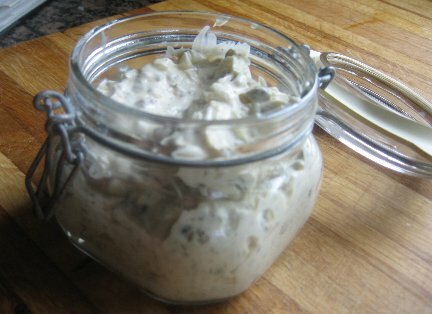 For me, tartar sauce is a slightly sweet/ slightly tart, fresh tasting sauce to be used sparingly to highlight the taste of wonderfully cooked fish. It’s not a cover-up excuse used to bomb the lack of flavor and rubbery texture of poorly cooked chunks of seafood flesh! I think that people like my tartar sauce because I don’t go putting a bunch of spices or seasonings in it. Too often I see these mile long recipes that add cumin, paprika, old bay seasoning, celery salt, garlic powder… you name it, there’s a tartar sauce recipe that has you adding it to the mix. The recipe above should carry you and a guest through a week of fish.